Stress fractures are usually caused by overtraining or overuse. They can also be caused by repeated pounding or impact on a hard surface, such as running of concrete. Increasing the time, type or intensity of exercise too rapidly is another cause of stress fractures to the feet, as is wearing improper footwear. Women seem to be at greater risk of foot stress fractures than men. This may be related to a condition called "the female athlete triad," which is a combination of poor nutrition, eating disorders, and amenorrhea (infrequent menstrual cycle), that predispose women to early osteoporosis (thinning of the bones). The result of this decreased bone density is an increase in the risk of stress fractures. High impact sports such as running, gymnastics, and volleyball can increase the risk of stress fractures. In all of these sports, the repetitive stress of the foot strike on a hard surface causes trauma and muscle fatigue. Without the right shoes, good muscle strength or adequate rest between workouts an athlete can develop a stress fracture. The best treatment for a stress fracture is rest. Taking a break from from the routine and doing some low impact exercise for a few weeks (six to eight) can help the bone heal. If rest isn't taken, chronic problems such as larger, and more persistent stress fractures can develop. 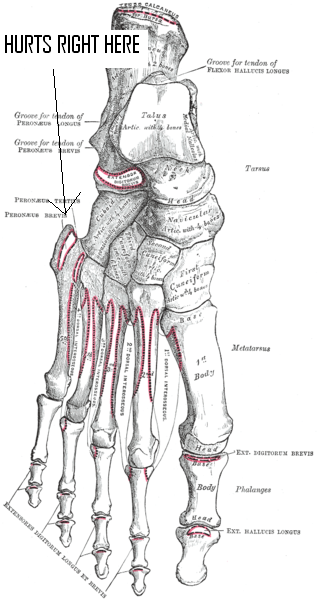 Re-injury may result in a chronic foot problem and the stress fracture might never heal properly. Use the proper footwear and replace shoes when needed.